I must tip my hat to the Barefoot Contessa for this one. I enjoy so many of her recipes because of her choice of simple ingredients and simple flavors that really let the flavor of the food shine through. Plus, spending my days chasing after my one year old and three year old Ecokids, I usually don’t have much time for anything more complicated than this! Like other cruciferous vegetables (cabbage, broccoli, cauliflower), Brussels sprouts are high in antioxidants. Include crucifers in your regular diet, and you are decreasing your chances of cancer. Brussels sprouts also fight inflammation in the body, which is a leading cause of disease and general “unwellness” in the United States. Brussels sprouts are also one of Ecodaddy’s favorite veggies since his childhood, so I knew I’d have one fan before I even began. He cooks with a lot more spice than I do, so I wondered if the simplicity of this dish with just salt and pepper would appeal to him. I salted them heavily, like French fries, per Ina May Garten’s recommendation. He went back for seconds. And thirds. Nuff said. And hey: when your three year old asks for more, then shovels them in like there’s no tomorrow, you know this recipe is a keeper! Trim tough brown ends of Brussels sprouts and remove any yellowed leaves. 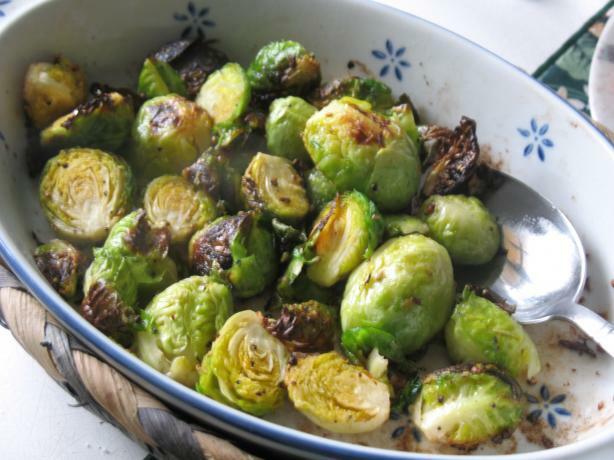 In a large bowl, toss all ingredients until Brussels sprouts are well coated. Turn them out onto a baking sheet lined with silicone mat, parchment paper or foil. Bake for 35-40 minutes until crispy on the outside and tender on the inside, giving the pan a shake every ten or fifteen minutes to insure they brown evenly. Serve immediately. For me, the best part is the outer leaves that fall off when you toss everything in the bowl … lay them out on the baking sheet with the Brussels sprouts, and they will crisp up like tiny little potato chips!